This comic perfectly captures the element of absurdity in Apple's standoff with the FBI. At this point, the legal and rhetorical battle between Apple and the FBI over access to the data stored on a San Bernardino shooter’s iPhone has escalated to such an extent that it’s almost impossible to imagine either side backing down. But a cartoonist named Dustin Rogers has imagined just that—well, not just that—in a Web comic that finds an element of absurdity in an otherwise deadly serious legal and policy debate. 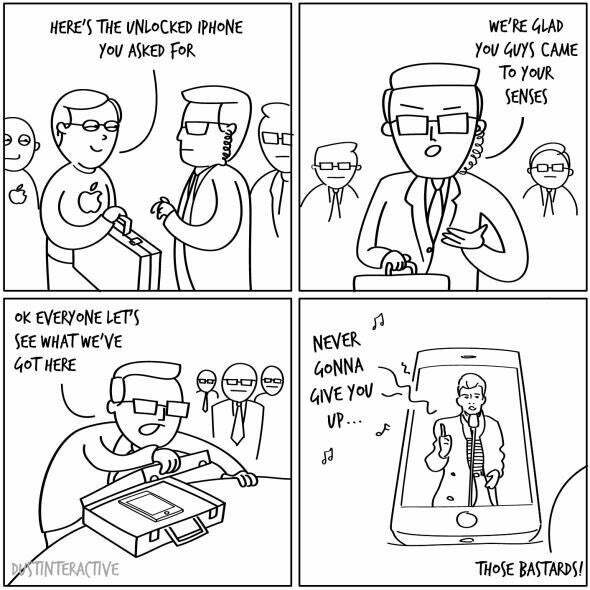 Published initially on Rogers’ Tumblr blog and Imgur page, the comic envisions a scenario in which Apple ultimately complies with the FBI’s request that it unlock the phone—but the contents aren’t quite what the authorities were hoping for. But, at the risk of dissecting the frog, I think the comic resonates at least in part because it captures the seemingly unbridgeable disconnect between the worldviews of the pro-Apple and pro-FBI campsand their respective inability to comprehend each other’s stances. The feds are drawn as stone-faced flunkies who are so tech-unsavvy that they’d fall for an Internet prank that peaked six years ago. No doubt this is how many in the tech community view them. The Applers, meanwhile, are smug, besweatered, and so insulated in their Silicon Valley bubble that they appear to regard the investigation of a mass murderer as a joke. That, by the way, is precisely the stereotype that the U.S. Department of Justice is publicly trying to pin on them. There’s one other, often overlooked facet of the case that the comic serves to highlight: We really have no idea what’s on Syed Farook’s iPhone. The unspoken assumption seems to be that the information contained therein would prove to be pricelessly valuable, if only the FBI could get at it. And perhaps it is! But what if it isn’t? What if, after all the legal wrangling and political posturing and semantic debates and high-level technical discussions, the phone turns out to contain nothing of value? That would be genuinely unfortunate, insofar as it would fail to advance the investigation or bring closure for the victims or their loved ones. But it would also be a fitting anticlimax to a case that has taken on such outsize implications that both sides could be fairly accused of losing perspective. Farook’s iPhone, in short, could turn out to be a real-life MacGuffin driving the action of a plot that’s really about much broader legal precedents and philosophical principles—not a rickroll so much as a rosebud. In a way, Rogers’ comic functions as a rickroll in itself, playing on the media’s and the public’s fascination with the latest developments in a case that neither seems ever to fully understand. Speaking of which: Did you click on the headline of this post hoping that the true essence of the Apple/FBI fight would actually be revealed to you in the course of a snappy 500 words? I’m so sorry. For that, you’ll have to read this far more in-depth and authoritative article instead.